Let’s jump right in and try not to get bounced off the bridge by Bowser. No GAME OVERs here. We’re all coming at this quilt along from different skill levels, so I’m going to try to explain every detail I can. I want this to be something everyone can do because I know you can! And the very first step is cutting fabric. I wouldn’t always cover this step but we are cutting small pieces and I think that deserves an extra dose of attention. All fabric for the blocks (read NOT sashing) will be cut at 1.5″ square. And that is pretty little. But with the number of blocks I wanted to include and trying to keep the quilt at a reasonable size, this is where we are. 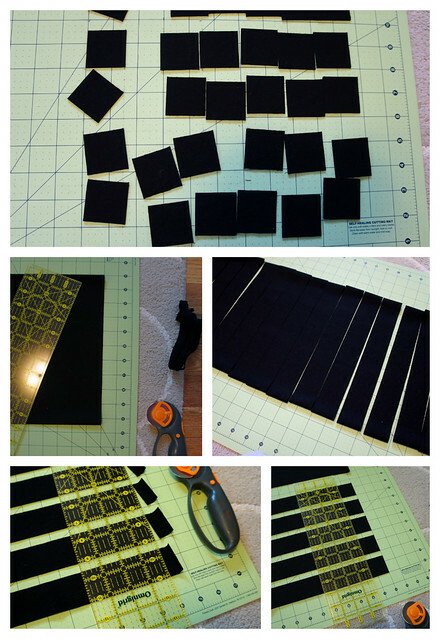 So, a couple of tips for cutting small squares. • fold your fabric at least in half or fourths to cut strips. I personally find the fabric more stable when cutting through multiple layers. The fabric holds itself in place. Don’t make the strips so long that you are not able to cut them in a single pass with the rotary blade. • as you cut your strips, leave them as close together as possible. Just pick your ruler and move it along the fabric. Then to cut the squares, turn your CUTTING BOARD instead of your fabric. By keeping the fabric in place you are leaving less room for error. Cut off the edge to give you a clean edge on all of your strips and cut at 1.5″ widths again. You are left with perfect squares! Oh I know that there are lots of questions on this! First off let me reassure you that you DO NOT NEED the stabilizer in order to make this project. It is a tool to make the process go more quickly and get more perfect seams and hopefully help you avoid design mistakes. But I know that it is expensive, so please don’t run away because of it. Also, there are alternative options to the stabilizer like a grid interfacing…just be aware that everything has it’s pluses and minuses. That being said, I’m going to give my directions for using the Pellon Stick-n-wash Stabilizer. This product is very fun! It has a true paper side and a fabric like side. The paper side peels away to reveal an adhesive surface that you simply press your fabric on to. No ironing! Turn the stabilizer and again draw lines 1.5″ apart along the length of the piece. You are left with a 27″ pieces with a 1.5″ square grid. Now for the FUN!! Laying out all of those little fabric squares. 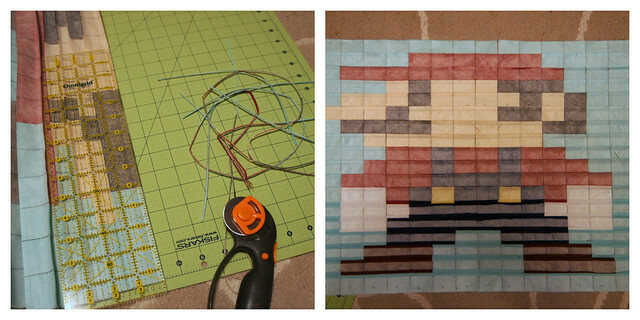 This step will be the same for every block, but as you can see here I obviously am working on the Mario Block. So the fabric arrangement clearly changes with each block, but all are the same size with the same total number of squares. Print off the PDF pattern for the week with character we are making. 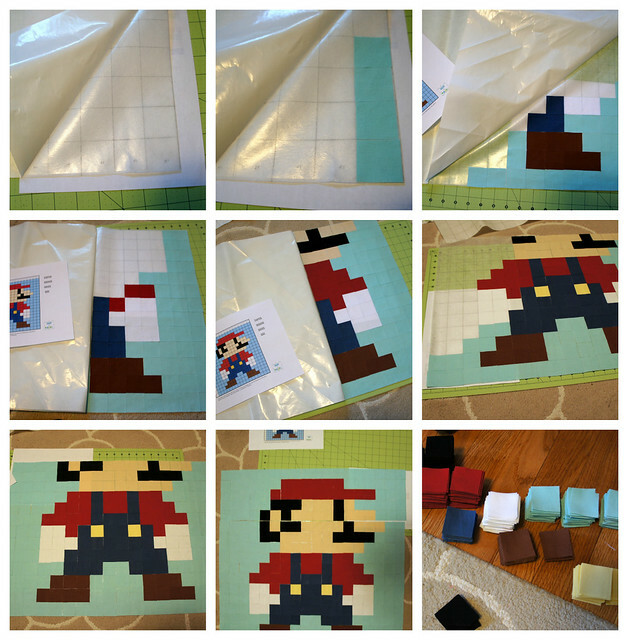 (The Mario link is at the end of this post) The PDF will tell you which color you need and how many 1.5″ squares of that color are in the block. Please refer to the original fabric list for any questions on the colors themselves. 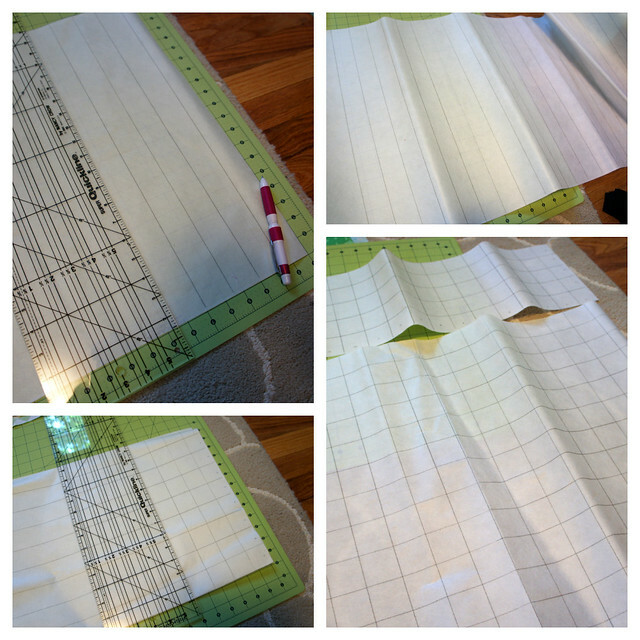 Peel back the paper in small sections and place the fabric on the adhesive following your grid and the PDF pattern for fabric arrangement. Now it is time to sew! And it is easy peasy. Just fold the stabilizer along each line, folding the fabric right sides together. The piece will WANT to fold at each line because of the break between fabric pieces. 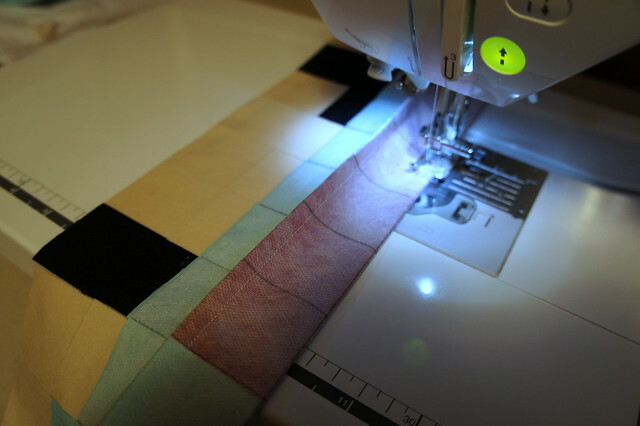 Decide whether you want to sew vertical or horizontal lines first and sew a 1/4″ seam along the entire length of each line. (At the step where you need to connect the smaller piece of stabilizer to the larger piece just sew these together as you would any pieces of fabric with a 1/4″ seam). Sew along every seam in one direction. Before sewing along the seams in the other direction, you need to trim the seam allowances on each seam you just sewed. You are going to reduce bulk this way and be able to iron your piece flatter. I attempted to press my seams open here but I didn’t make it through too many rows before that became just too annoying for me. So I ended up pressing all of my seams in one direction from the FRONT because it was so much simpler. It makes the next step only slightly more annoying and this step infinitely more easy! 😉 But do whatever you want. Now sew the piece again along the seams running the opposite direction…you will start to see the piece shrink down to its actual size! Stop and take a peak every now and then because it’s pretty awesome. And check him out!! (He still has the adhesive) Perfect seams even if you didn’t actually make perfect lines. Now it’s time for the fun and perhaps scary part. But it’s kind of awesome. 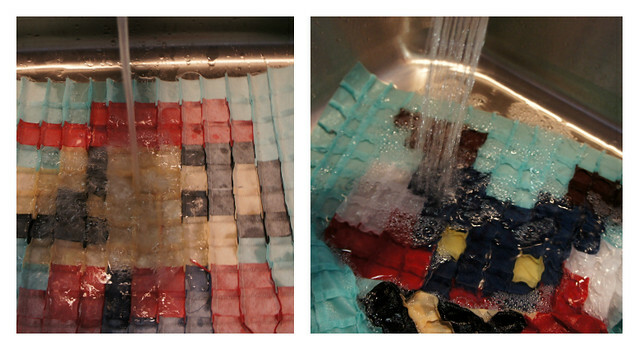 Take your block to the sink and run it under a spray of water on the back side of the block. It will take a bit of time because we have used such a large piece, but the adhesive will dissolve away. It’s kind of gloopy (yes, my official term) as it comes off. WARNING: DO NOT STRETCH YOUR BLOCK. I don’t mean to shout, but when you run a sewn item under water it becomes a bit vulnerable. Those perfect seams you just made could get stretched out of place. So be gentle. When you are happy with the amount of adhesive that is gone from the back, let the piece air dry on a flat surface. And then it is on to the next block!! My quilt design includes 12 unique block designs. Make 1, make 12, design your own…just join in the fun! And be sure to add your creations to the flickr group so we can all see what how we are doing! You can download the PDF of Mario HERE. And if you are anxious to get going on the next one, you might notice another similar pattern is up as well. 😉 Get going you over achievers. oh wow! that is amazingly brilliant. I know a little boy who would LOVE one of those! Angela, you are amazing. 🙂 This is going to be the best QAL ever! Lol, I'm really excited and glad I joined in. Thanks for all your hard work making up the patterns and directions! Brilliant, but where to get it? Especially when not from the US? And in smaller increments than 10 yards? I've been somewhat unlucky with my quick google search. Anybody else luckier? Do you happen to know if you can iron the backside of regular stabilizer? I'm debating between the wash-away and regular old light-weight fusible. yes, typically you can iron the back of a regular fusible. You may want a pressing cloth or lighter heat, but just follow the manufacturer's instructions. Thats awesome! I am going to try it this weekend. Maybe paper piece because i have it on hand!! My son thanks you, he has asked for a Mario quilt for a couple of years! This is so fantastic. I am longing to give it a go but can't find any of that stabiliser in the UK anywhere. Would love to hear more about anyone trying this with just lightweight fusible interfacing instead. wow, that is so clever, and may be the solution to my peace medallion ufo – every time i look at the 2.5 inch squares it bums me out! The stabilizer sounds like a lot of fun to use. Unfortunately I can't find it anywhere. Just two or three places online, and you need to buy a 10-yard bolt for $90+ So I'm thinking I'm gonna wing it. BTW, you hint that another block is posted…perhaps Luigi…but I could not find anything else. Am I missing the obvious? yes Luigi is there too. But he will have his own link…you probably need to search under other projects listed by me on that page. I went ahead and moved some things around so that he is easier to find. I'll have all of the blocks in one collection on the site now. this is the cutest thing ever!! I downloaded the PDF, but I can't join the quilt along right now, too much stuff going on…. 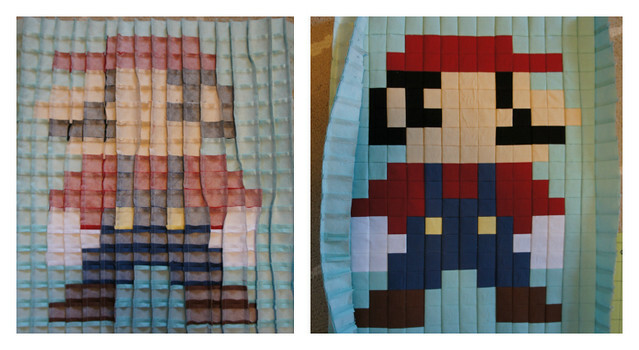 I can imagine this one with larger blocks and a quilt JUST being mario….I'm a new follower, sent from fantom stitches. You give so much helpful information, Angela. I love the humor with which you share your insight. Hello! I just found your site and I'm exciting to be part of your quilt along. I got your address by Fandom in Stitches. Thanks. I may not be able to do a lot of these, but I can try! When I go to the FQS and click on the link for the fabric, I'm confused if all the fabric is listed on their site. It seems as though you list nineteen fabrics to their fifteen. Are they missing some on their list? the link at the fat quarter shop is for the fat quarters alone. There are other colors that require more yardage that you will need to purchase separately. Hope this clears it up. This is amazing. I'm so joining in on this! Saw your button for Mario, but do you have one I can post on my blog for you? How big is the quilt top to be when its done and what are the measurements of the blocks by themselves? I might have missed it somewhere, but just couldnt find it. Thank you for doing this! Thank you for such a wonderful design! My son thinks it is going to be for him! Bwahahahaha! Ok so I missed downloading Mario but have all the other blocks. When I go to get Mario it says I need a subscription. Can you help me out here? Thanks. I wanted to download the PDF but it says I have to be a premium member which costs $. Can anyone email me a copy? quittersnvrwin at g mail dot com I am thinking I will use the pattern but with larger squares so the whole quilt top will be Mario. OK so I went to buy all my fabric today, thinking what a terribly stupid thing I was doing taking on this challenge (albeit it VERY late) and how was I going to get all these seams straight AND finish it by my little guy's birthday in mid Feb. By the way, thank you for catering to my little guy's LOVE for mario. And lo and behold I log on to get details and I discover this incredibly ingenius way you have created the quilt so that even I wont mess up the seams! You're a GENIUS!! Seriously. Can't wait to start this. 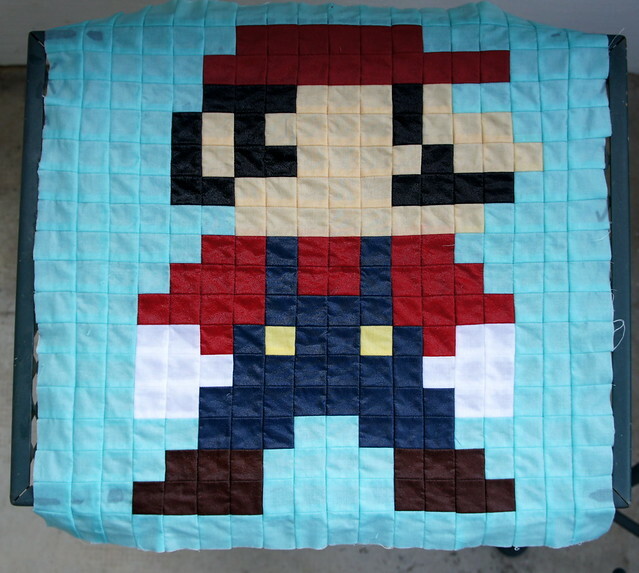 I am in the middle of choosing a quilt to make for my grandson who is all absorbed in Mario….I found your quilt and I am so excited to start this but must wait until I can make it to a fabric store (6 hours away)to pick up the materials!! I am making a Yoshi quilt for my step son and came across your blog, I was totally uplifted that it could be done. With a little research I was able to find a site to turn a picture into a quilt pattern and have bought the material. I am stuck though in finding the Pellon Stick-n-wash Stabilizer. Do you know where I might find it? Thanks! A couple things I learned already: Jet.com had the stabilizer the cheapest, and since it was my first purchase, I was able to use a discount code — still somewhat expensive, just not so expensive. Really, for this whole project you need a bit more than one bolt, so I just bought the whole thing. Also, since the stabilizer has kind of stiff paper backing, it doesn’t want to lay flat after you unroll it, which made drawing a grid on the whole thing just too annoying for me. My solution was to draw a grid on a piece of foam board — it was wider and almost as tall as the stabilizer, so it worked pretty good. Then I just used a few thumb tacks to hold the stabilizer to the foam board and I could see my grid behind it to line up my squares.